BEIJING, April 28, 2018 /PRNewswire/ — Hanergy, a pioneering multinational clean energy company, today announced the launch of its “Lighting Africa” Project, under which the company will donate its first off line bath of solar-powered Humbrella, which is worth of a million RMB (US$160,000) to Africa through the China NGO Network for International Exchange. The Hanergy 2018 Humbrella CSR Launch Ceremony was attended by ambassadors from 22 African nations as well as representatives from 8 NGOs, 10 multi-national companies and stakeholders from various circles. Humbrella is the latest addition to the company’s growing roster of mobile energy solutions. Combining the world’s highest conversion efficiency thin-film solar panels with the common umbrella, the Humbrella integrates four functions including off-grid power supply, electricity storage, night lighting, and terminal charging. The Humbrella has a diameter of 2.7 meters and weighs only 8.8 kilograms due to Hanergy’s amazingly light & flexible thin film solar panels. Currently, only 37% of Africans have access to a stable power supply and electricity shortages routinely prevent children from having enough time for study, seriously impacting their education. The Humbrella offers a practical solution to this problem by converting sunshine and store as much as 40000 mAh electricity, ensuring a 10-hour high quality reading time for children, or charging more than 10 3000mAh smart phones. In addition to lighting, the Humbrella is equipped with 4 UBS ports, which could be plugged for lamps, small fans, or electric insect repellent. “I take this opportunity to invite Hanergy Group to consider the possibility of investing in the energy sector in Senegal by taking advantage of the many opportunities and incentives that my government offers to foreign investors,” said Mr. Mamadou Ndiaye, Senegal ambassador to China. Although in the popular imagination Africa has a beautiful and clean natural environment, the fact is that air pollution is very serious in many areas due to the widespread use of diesel power generators. These generators emit toxic and harmful gases and cause respiratory and heart disease while also contributing to the occurrence of acid rain, which threatens food production and biodiversity. Because the Humbrella leverages thin-film solar power generation technology to directly convert solar energy into electricity, it can replace diesel generators and achieve “zero emission” energy. 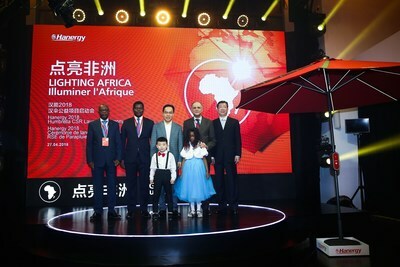 The Humbrella launch event in Beijing also saw the establishment of Hanergy’s public welfare initiative, the “Lighting Africa Foundation.” Open to participants from all over the world, the foundation will match every purchase of a Humbrella sent to Africa with one US dollar to be invested in long-term poverty alleviation and public welfare activities, thus doubly contributing to the public benefit of local communities in Africa. “As China’s largest NGO, we welcome more companies like Hanergy could contribute to African people’s welfare. Hanergy provides a good mobile energy solution to Africa and sets a good example of corporate social responsibility. Hopefully more organizations and companies could join the project in making the world a brighter place,” said Liu Kaiyang, Deputy Secretary-General of China NGO Network for International Exchanges. Hanergy, the world’s largest clean energy company, has a comprehensive clean energy solution, covering hydro-power, wind-power, and solar power. Since 2009, Hanergy focuses on thin-film solar power research and development, and is launching a series of products including solar roof tiles, foldable solar-paper power bank, solar backpack, Building Integrated Photovoltaics, solar roads and many others. With a worldwide staff of more than 16,000 and more than 2500 patents, Hanergy is devoted to providing the world a clean energy solution for a better life and sustainable world.